This Russian satellite station, facing the US Embassy, is suspected to be the site for spying activities. 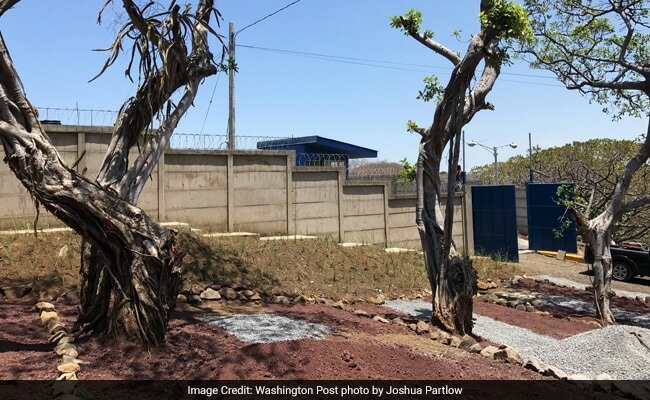 On the rim of a volcano with a clear view of the U.S. Embassy, landscapers are applying the final touches to a mysterious new Russian compound. Behind the concrete walls and barbed wire, a visitor can see red-and-blue buildings, manicured lawns, antennas and globe-shaped devices. The Nicaraguan government says it's simply a tracking site of the Russian version of a GPS satellite system. But is it also an intelligence base intended to surveil the Americans? "I have no idea," said a woman who works for the Nicaraguan telecom agency stationed at the site. "They are Russian, and they speak Russian, and they carry around Russian apparatuses." Three decades after this tiny Central American nation became the prize in a Cold War battle with Washington, Russia is once again planting its flag in Nicaragua. Over the past two years, the Russian government has added muscle to its security partnership here, selling tanks and weapons, sending troops, and building facilities intended to train Central American forces to fight drug trafficking. The Russian surge appears to be part of the Kremlin's expansionist foreign policy. In other parts of the world, President Vladimir Putin's administration has deployed fighter planes to help Syria's war-battered government and stepped up peace efforts in Afghanistan, in addition to annexing the Crimean Peninsula and supporting separatists in Ukraine. "Clearly there's been a lot of activity, and it's on the uptick now," said a senior U.S. official familiar with Central American affairs, who spoke on the condition of anonymity to discuss the sensitive situation. As the Beltway world untangles the Trump camp's links to Moscow, American officials are also puzzling over Russian intentions in its obscure former stomping ground. Current and former U.S. officials suspect that the new Russian facilities could have "dual use" capabilities, particularly for electronic espionage aimed at the United States. Security analysts see the military moves in Central America as a possible rebuttal to the increased U.S. military presence in Eastern Europe, showing that Russia can also strut in the United States' back yard. American officials say they are not yet alarmed by the growing Russia presence. But they are vigilant. The State Department named a staffer from its Russia desk to become the desk officer in charge of Nicaragua, in part because of her prior experience. Some American diplomats dispatched to Nicaragua have Russian-language skills and experience in Moscow. 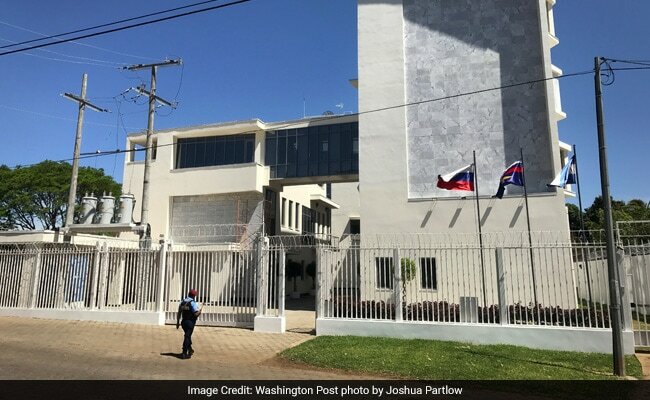 A four-story anti-drug training center, built near the Russian Embassy, is intended to be used to train counter-narcotics authorities from across Central America. But some security experts also suspect that it is intended for spying activities. Nicaragua's president's office, the foreign and defense ministries, and the police all refused to address questions for this report. The Russian Embassy in Managua also failed to respond to several queries. Spy games and Washington-Moscow power struggles are old hat for Nicaragua, a country the size of Alabama with a rich Cold War history. The Soviet Union and Cuba provided soldiers and funding to help the government of Daniel Ortega and his leftist Sandinista National Liberation Front after they overthrew the U.S.-backed dictator Anastazio Somoza in 1979. The CIA jumped in to back rebels known as the "contras" fighting the Sandinistas in a war that killed tens of thousands. The collapse of the Soviet Union brought an end to such Cold War conflicts. But in the past decade, and particularly under Putin's rule, Russia has sought a bigger world footprint. In Latin America, Russia has sold billions of dollars in weapons to Venezuela. Russian helicopters are used by militaries in Peru, Argentina and Ecuador. While U.S. and Chinese trade in Latin America is far larger, Russia has intensified economic ties with several countries, including Mexico and Brazil. When Ortega was reelected in 2006, after 16 years out of power, Nicaragua once again became a Russian friend in the region. The new relationship initially had a civilian focus, with Russia donating wheat and sorghum to Nicaragua, one of the poorest countries in the Western Hemisphere. Russia gave hundreds of boxy buses to Ortega's government and is building a factory to manufacture vaccines. "The economic cooperation was a facade," said Roberto Orozco, executive director of the Center for Investigation and Strategic Analysis, a think tank in Managua. "What the Russians really wanted is an active military presence." In the past few years, the partnership has been militarized. In 2015, Nicaragua's parliament, dominated by the Sandinistas, passed a resolution allowing Russian warships to dock in Nicaraguan ports, following earlier agreements to permit patrolling in coastal waters. Russia began supplying armored personnel carriers, aircraft and mobile rocket launchers. It provided 50 T-72 tanks to Nicaragua, which Ortega paraded through Managua, generating criticism from the public. The country's military leaders already had an affinity with Russia, having used Soviet-supplied equipment fighting the contras and received training in the Soviet Union. While Venezuela has nearly collapsed economically and Cuba has improved relations with the United States, Ortega's government has emerged as Russia's most stable ideological ally in the hemisphere. "The most fruitful political relationship that Russia has, and where it's made its greatest advances, has been Nicaragua," said Evan Ellis, a professor of Latin American studies at the U.S. Army War College. He and two U.S. customs officials were expelled from Nicaragua last year, with the government saying it should have been notified of their presence. Nicaraguan security experts estimate that Russia has about 250 military personnel in the country. Jacinto Suarez, president of the Nicaraguan parliament's foreign affairs committee, and an ally of Ortega's, said in an interview that the relationship with Russia is the natural outgrowth of the ties the countries developed in the 1980s. He dismissed those worrying about "nonexistent military threats." "Look at the commotion with the Russian tanks," Suarez said. "And nothing happened. They said that war was coming when those tanks arrived." Current and former U.S. officials have a variety of theories about Putin's intentions in Latin America. Some consider Russia's military actions a response to the Obama administration sending more U.S. troops and weapons to NATO countries in Central and Eastern Europe. Others worry that Russia could be pursuing ambitious spy goals, such as intercepting Internet traffic in the ARCOS 1 fiber-optic cable that runs from Miami down the Caribbean coast of Central America. Speculation is rife that the new Russian satellite site on the lip of the Laguna de Nejapa crater will be a spy facility, even though Nicaraguan officials have said it will be used for GLONASS, Russia's equivalent of GPS. "The United States and countries of the region should be concerned," Gonzalez said. "Nicaragua offers a beachhead for Russia to expand its intel capabilities and election meddling close to the United States." Hugo Torres Jimenez, a retired Nicaraguan brigadier general and a member of the opposition, said Ortega was encouraging the Russia ties because "he has an obsession with the international spotlight, and he sees in Putin's government the reincarnation of the old Communist Party." The Russian buildup in Nicaragua has coincided with deteriorating relations between Washington and Managua. Last summer, Nicaragua's supreme court and electoral council, both seen as loyal to Ortega, blocked the leading opposition candidate from participating in the November presidential election and forced opposition lawmakers out of the National Assembly. Ortega cruised to victory, winning a third straight term, in an election the State Department described as flawed and undemocratic. House legislation known as the "Nica Act" was reintroduced this week, an attempt to block funding for Nicaragua from international institutions unless the Ortega government makes democratic reforms. Last year, the Obama administration quietly pressured the Inter-American Development Bank to postpone a $65 million loan to Nicaragua to show displeasure with the election, according to a former U.S. official, who spoke on the condition of anonymity. The Russian presence has generated mixed reactions among Nicaraguan citizens. Some consider Moscow a long-standing ally. Others worry that the Nicaraguan government could use the new Russian equipment to spy on its domestic critics. Nelson Perez, a 53-year-old bus driver, wished that Nicaragua had just received a better brand of bus than the Russian-made KAvZ he was maneuvering through Managua traffic. "They're not good for this climate; they overheat," Perez said. He complained about the narrow passageway, the rattling mirrors, the leaky roof and windows. "These are not comfortable." In the upscale neighborhood of Las Colinas, a gleaming four-story Russian-built counternarcotics center appears nearly completed. A security guard at an apartment building next door doubted any good would come from it. "They say it's an anti-drug mission, but who knows," he said. "Poor people have not received any benefit from Russia." Ismael Lopez Ocampo in Managua and Gabriela Martinez in Mexico City contributed to this report.